more info about ana at her myspace and homepage. big thanks to ana for taking the time to put together the mix for us. next week we've got a serious techno workout from silent servant off sandwell district. 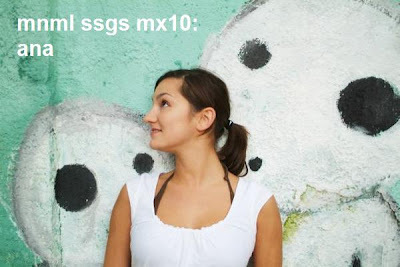 after that, we've got artists from circus company, raster norton and ostgut that are all doing ssg mixes. plenty more great sounds of the way. in the meantime, enjoy the 10th in the series from ana. Beauty mix! Thanks Ana, it's loaded with killer tracks. Any chance of a tracklist? Noton. Common mistake, one I've made several times as well. It gets a bit more exciting in the second half - some quirky tracks. I'd like to identify a few of those. Thanks ana and ssgs - I'm looking forward to the next ones...is there a fengler mix on the horizon? Does anyone know the name of the first track? It's got a great sound. can we get a tracklist please? been hearing the track with the girl vocal around minute 29 in a few interesting things lately, anybody know what it is? Great great great mix from Ana! this is great, thanks. any chance of seeing of a tracklist? i've asked ana for a tracklist. will post it if i get one.